Adam Sandler has released a lot of films that have made us all want to cry out of disgust and despair for the movie industry, but Click is possibly the only film of his that has genuinely been responsible for real, genuine sadness. Click’s plot is set in motion when architect Michael (Adam Sandler) does some late-night shopping in Bed, Bath, and Beyond, and ends up being gifted an unusual universal remote that turns out to be a lot more universal than he was expecting. 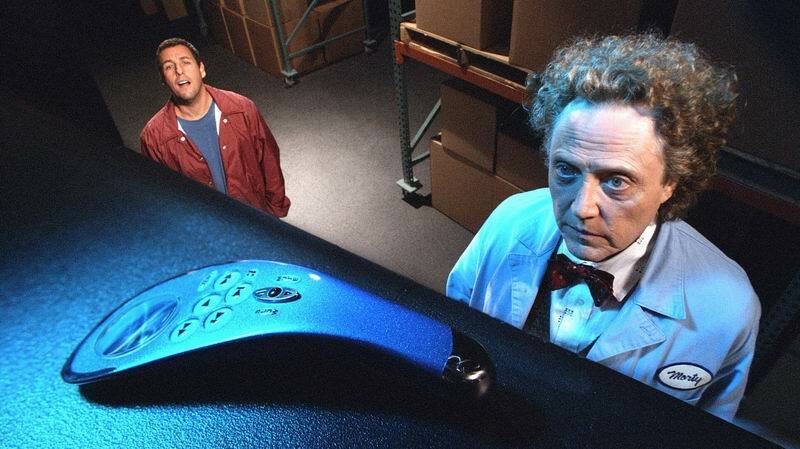 This new remote, that was given to him by a mysterious man called Morty (Christopher Walken), gives Michael the power to control his life and dictate time. With it, he can freeze moments, fast-forward through them, reverse them, mute sound, and pick and choose the chapters of his life that he wants to experience. What initially seems like the perfect device for happiness, quickly becomes a traumatic time-tool that shows life is for living, and not for toying with. It still seems utterly bizarre to me that this movie was marketed as a comedy and a family film. I can tell you with certainty that this is not a funny movie in any way, shape, or form. Sure, there are moments of levity and the inevitable Sandler-flick puerility, but apart from a few childish gags, there is nothing here that would make you even remotely happy. Maybe we’re meant to find it funny how Michael can mute the sound of his dog barking, or how he discovers a picture-in-picture setting that allows him to watch the ballgame despite “life” happening around him. The crux of the film, however, involves a workaholic husband and father who doesn’t spend enough time with his family and who is too self-involved to enjoy life while he can. By skipping the “bad stuff”, he misses out on his life as a whole, which frankly, is an all too scary reality for all of us. Watching Click is like being smacked in the head with a bag of bricks. At one point or another, it inevitably dawns on us that we are all guilty of failing to live in the moment, being too distracted by that promotion, or that next big thing that makes us lose sight of what really matters in life. Michael uses his remote to mute an argument he has with his wife (Kate Beckinsale), and to fast-forward through what he considers to be a boring family dinner. He jumps to the moments he cares most about, like successes in his job and other work-related triumphs. So busy is he fast-forwarding through “insignificant” moments, that eventually he realises his wife has left him and is happily married to someone else, and to top it off, he now weighs 400 pounds. It is a serious storyline with an unserious lead actor, which, in this particular case, simply does not work. It is easy to see how this film could have been great if it had been released a decade before, with, say, Robin Williams as its main actor, but sadly Sandler is just an ill-fit, resulting in an uncomfortable viewing-experience that just doesn’t do its story justice. Click is guilty of not giving its premise the seriousness and respect it deserves, and revels instead in its immature “humour” and obsession with bodily functions. Imagine if It’s A Wonderful Life decided to interrupt its storyline with farts and fat jokes. It wouldn’t be quite as hard-hitting, would it? Then again, Sandler’s Michael is no George Bailey, but the two films share similar “what if” plot lines. Perhaps director Frank Coraci (The Wedding Singer) couldn’t handle the powerful subject matter he had been given, or perhaps it’s simply down to miscasting, but whatever the case, do not, I repeat, do not watch this film if you’re feeling a little tender and a little blue. Save yourself, and click it off.